Why buy the MSG loaded boxed garbage when it’s nearly as simple to make your own healthy version? It always scares me a bit when I read the back of ready to assemble meal boxes. I spend hours in my grocery store scanning ingredient lists giggling and freaking myself out for fun. Do it sometime and watch the funny looks people give you! I can’t even pronounce some of the ingredients, if you can call them that. I don’t know where they’re from, what they really are, and if they should even be considered food. Seriously though, make your own versions of those boxed meals whenever possible. They’ll taste better and you won’t have to tell your family you fed them sodium hexametaphosphate, calcium lactate, disodium inosinate, disodium guanylate, and monosodium glutamate for dinner. Crazy chemical-laden cheap food products might cost less, but in exchange we pay with our health. No thanks. I’ll cut costs somewhere else. Just perfect, love it!! Clean, simple and yummy!! No boxes over here for my family either. Yucky! Funny you should mention your time spent gawking at ingredients at the market. Me too! I stare at labels, baffled by the garbage they put into so called "food." How about that idiotic "Smart Choices" program the government and sugary sweetened food companies put out there! It was the dumbest program ever. Love the clean eats!! We are on to something girl!! Perfect fall weather for this perfect comfort food! Mmmmmm....YUM! I bet my small grandsons would enjoy this en famille!! As soon as I saw this photo, I thought, "OMG, this looks good." Wow. bookmarked! I've never had chili mac but I'm ready to dive in. Looks great! wow -- that would be so good on a cold, snowy day! Wow! I could totally eat this right now! It looks delicious! This is our favorite winter-time meal, we eat it at least once a month and the days following with plenty of leftovers. Homemade is the best!! Great Photo! Excellent recipe, this is a GREAT one dish meal and the leftovers are PERFECT for lunch the next day because it just gets better and better (like soup) haha. This is great retro food...and there were no boxes then! I think this will be on the menu when my son comes home from school! I am chuckling because I was having a conversation with my son who is in college and he said that he was sick of making boxed dinners that have ingredients that he can't even pronounce. It is like you were a part of the conversation and came up with this dish!! I know that he could make this. . . EVEN Mr. Picky Head would eat this! It is a keeper for me. Thank you for that and have a great week. PS I have to come up with a different way of saying "Awesome photo?" I usually don't like chili...but oh my gosh, that looks delicious. Yummy! That looks delicious. I love your dishes! On a side note, I deleted your latest post on my blog about getting the PW cookbook. I bought one as a Christmas present for a friend that reads my blog and I don't want her to know I have it. ;) I made her chocolate sheet cake this weekend. All I can say is O.M.G.!!!!!! This has got to be one of the ultimate comfort foods! Wish I could have a whole bowl of this now! You're absolutely right - why buy when you can make something this good! my kidlets would love this. Laura, this look really yummy. I am always on the run, but boxed dinners or lunches are not made for me. I rather spend some extra time in the kitchen but at least I know what are we eating. that looks really tasty. i can't wait to try it out! 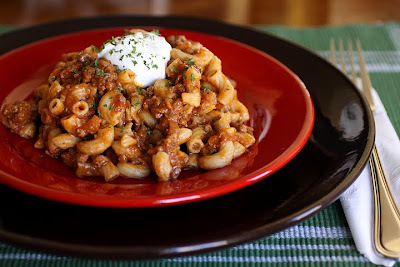 Chili mac is a favorite here. Your version looks hearty and delicious! Found your blog through Pink Little Cake. That chili-mac looks AWESOME! I plan on making it tomorrow night for the hubby! Chili Mac is one of my favorite casseroles and this one looks delicious! I just made this, and it is perfect! I didn't have coriander, but I put in everything else. Thanks for contributing to my yummy dinner! How in the world did I miss this post? Oh my... sounds like perfect family fair! Love the cilantro and pepper jack cheese... garlic, garlic, and more garlic... ahhh! Just found you from Schue Love, made this "man food" last night for the man and he went for seconds! (even though I forgot the green chilis! Oops) Yay, thanks for making this non-cooker Laura look like you! Laura thank-you for making this and letting me know it worked for you! I'm so happy! Hey Laura, today I made your chili mac with a few slight modificatons. I substituted shredded mozzarella cheese for the pepper jack, plus I used whole wheat elbow macaroni besides regular macaroni (50/50 ratio). I thoroughly enjoyed this main dish recipe. It reminded me of goulash, and I love goulash! Thank you Laura for posting this recipe. It's definitely a keeper!